This section of the website aims to offer helpful information on funding programs that may be suitable for tourism projects in our region. 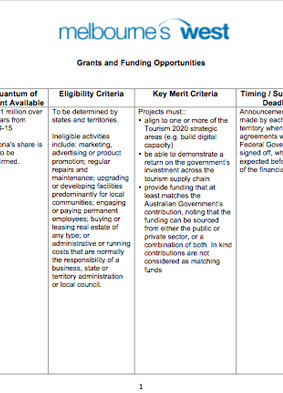 In April 2015 Western Melbourne Tourism completed an audit of the some of the key grant and funding program opportunities. The key opportunities are summarised here for you in the below download link. Tourism Victoria also offers useful summary of grants suited to the tourism sector available from the State or Federal government or the philanthropic sector.